Paying Tribute to Mary with Reverence, Love and Respect. On Friday May 20th, the Assumption School gather to honor Blessed Mary, the mother of all, at annual May Veneration. 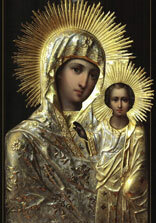 Throughout the New Testament, Mary's role in heaven is mentioned. Mary is alluded to as Queen in the book of Revelations. What a joy and consolation it is for us to think that we have such a powerful Queen in heaven, who has access to the treasury of God's graces, and who is both able and willing to dispense them to us according to our needs. For she is not only the Mother of God but our Mother as well. She always listens to us, she is always close to us, and being Mother of the Son, participates in the power of the Son and in his goodness. We can always entrust the whole of our lives to this Mother, who is not far from any one of us. Hence, let us go to her with confidence, fully convinced that there is no favor or grace that she will not grant us, if it is for the good of our immortal souls.